"The aim of the Ontario Cavy Club is to encourage the hobby of raising purebred cavies for exhibition and for pleasure." 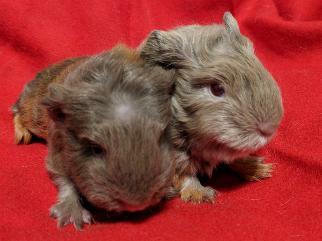 "We offer fellowship and assistance in raising cavies for show or as pets. " Our October feature pig is baby Swiss, Hadfield and Charlotte. Owned by L. Haslam. Our Next Show is Convention April, 2019 in Stratford, ON. When sending the Club payment through PayPal please make sure you click Friends and Family when you do not, the club pays a fee. Also, in the notes please specify exactly what you are sending the money for, it can be confusing when payments are received with no specification as to what the money is for. The OCC offers on average of nine shows per year throughout Ontario but mostly in the South West. The OCC has their annual convention show in the spring which offers pet and youth activities at the shows. Membership in the OCC entitles you to our informative newsletter published quarterly. Show flyers and catalogues are available on request. Head to be short and broad with good width to the muzzle. Eyes to be large, bold and bright. Ears to be large rose petal shaped, drooping and set with good width between. Body is to be firm, fit and of good size and weight appropriate to age.